It was a nightmare and the worst way to begin a trip to India for the two Pakistani visitors. They flew into Mumbai by the Emirates flight from Dubai and realised quickly that their baggage was lost. The six-hour wait for the next Emirate flight was futile. After making two trips to the airport and doing the rounds of three offices inside, the bags were finally retrieved the next day. "The clothes we wore on the first day were bought. That kurta was my husband's which I bought for him and thought what the hell!" 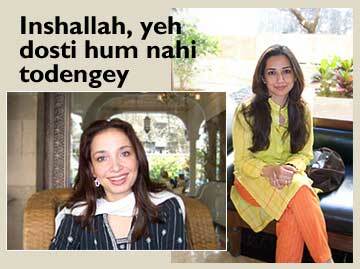 said Islamabad-based actor-activist Nighat Rizvi (top, right). Actor Ayeshah Alam (top, left) was in for a mad scramble of her own. "We were just here for four days, two of which were spent maniacally running around looking for something half way decent to wear, which was not oversized or too small. I'm not exactly like Miss Universe you know. Khair ho gaya, mil gaya, so that's ok," added the chirpy actress from Karachi. In Mumbai for a performance of Necessary Targets, a play on the lives of Bosnian refugees, the actors performed alongside Indian actors and were thrilled about their trip. Ayeshah had been here before, but it was Nighat's first. Her father hailed from Bhopal and mother-in-law from Delhi and she had heard a lot about India. It was very much a part of their lives in many ways and she wished her husband was there to share the experience with her. Imran had never been to India and she missed him terribly. The people were great, the hospitality, incredible -- he would have loved it. Inshallah, they all will be able to celebrate the New Year in Rajasthan, it was something they had been planning for a year. Noor, their 17-year-old son studying in the UK, and Hasan, 15 who lived with her were to join them. "I really want my boys to see India. I want them to have a feeling of comfort with this country. Let not our history affect the present. I wasn't part of the history we share but it is with me. It lives with me and it's a lovely feeling," said Nighat, one of the first women in Pakistan to publicly work on AIDS awareness and a key member of Amal, an NGO working on gender issues, violence and HIV. "You are a great people and it has been a pleasure to have a slice of that. I don't feel I'm in a different country. " It was this comfort that made it all so special for Ayeshah too. Looking relaxed in a simple salwar-kameez, she could have been an Indian sipping on her masala chai by the poolside restaurant at the Taj Mahal Hotel. "Normally when you are in a foreign country, you say a few words in your own language and say -- 'Oh I'm sorry' and repeat it in English,' she says, 'But here you are so relaxed, you know everyone understands you. The people are very similar, similar clothes, language, we've heard this before, we know this." Born of a Pakistani father and Swiss mother, the film and television actress had started her career at 17 -- what she calls as a 'floozy model.' Her family originally came from Ghazipur, 20 miles outside Lucknow and her grandfather had married a Britisher -- "So I'm a total burger," she laughs. Modelling in Pakistan in the late eighties was very taboo, she says. Hai, hai acchi ladki nahi ho sakti hai, yeh modelling karti hai [goodness, a model can't be a nice girl] was the usual reaction. Now of course, it had become the 'in thing' to do because people presumed models were pretty and valued them as a good catch for marriage. After a failed first marriage, modelling came to Ayeshah's rescue and boosted her self esteem. It was tough she recalls -- she left her little daughter with her mother-in-law, was refused refuge by her father, forsook a rich life and had to learn things like catching a bus or buying a pair of shoes on her own from scratch. But she was soon on her way and graduated from modelling to theatre and then to acting, directing and production for television. Last year she won a special juror's award for her role in Daira at the Karachi International Film Festival. "The journey goes on. I keep walking," says the Christian actor who was married for the second time to rock group Junoon's bass guitarist Brian O'Connell and is now a single mother living with their two children. The couple lived across the street from each other and met through a mutual friend in 1992. Ayeshah was a friend of the group's lead singer Ali Azmat who went to high school with Brian, and felt Brian was the gentlest man she had ever met. At that time Junoon was a far cry from the rock icon of the subcontinent that it is today. Their fans did not include swooning audience in half the Hindi-Urdu speaking world, they did not have an audience with the likes of General Pervez Musharraf, one of them was not singing Garaj Baras for a Hindi film. Their audience in those days was on college campuses and that is where Ayeshah and Salman's [the group's lead guitarist] wife Samina trekked to to rustle up support. 'Mar mar ke logo ko bulatey the [we died begging people to come] and used to say 'khuda ke waste aana', [for God's sake come] the boys are cute, their music is great," says Ayeshah. O'Connell and she dated through those early days. She proposed, they married and split 11 years later. "To see Brian get to the top and make it was amazing. That was his dream." While the Sufi rock band united many Indians and Pakistani through their music long before the peace moves between Prime Minister Vajpayee and Musharraf got underway, Ayeshah feels the general is the best thing that happened to Pakistan. "I know President Musharraf is trying to do his best. I am a huge supporter of his. We are two nations. You are proud of India, we are proud of Pakistan. Let us work together to make this region the most amazing region in the world." The actor says compared to former prime ministers Benazir Bhutto and Nawaz Sharif, Musharraf has done some good things. "We (India and Pakistan) won Independence from foreign rulers, we should be celebrating together." After many years, the neighbours are indeed celebrating together -- openly. Cricket has brought an easy comfort on the pitch, in the atmosphere and both Ayeshah and Nighat, who although aren't too big on cricket, are excited. "I hope the Indian cricketers have a good trip and come back safely,' says Nighat who was a great fan of Zaheer Abbas and Imran Khan and finds Sachin Tendulkar very cute. Not one to watch each Pakistan game, she will be watching this series because the whole world is, and she doesn't want to be left out. Ayeshah, a self confessed lover of the loud cheering-kind-of-noises, says she may not be a cricket fan but she is patriotic and wants her team to win. "I am hoping everyone says 'it's just a game' and treats it like that. Let us put the nuclear bomb and everything aside and all play cricket, we'll be much happier." Going by the happy scenes of camaraderie in the stadiums of Karachi, Rawalpindi, Peshawar and Lahore, it seems people are doing just that. Think about it, can anyone really ponder about the Bomb when Sachin is at the crease or Shoaib at the top of his run-up?